This is a look at Europe by an Australian information technology professional. 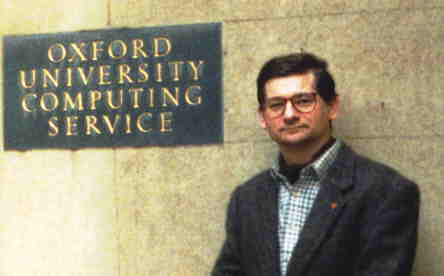 In 1994 I visited Oxford University and reported the trial, tribulations and tips of checking my e-mail while abroad. This includes how to: talk your way into a university computer centre to check your e-mail and write an academic paper without effort, while on holiday. It was given as a talk to the Australian Computer Society Canberra Branch on 20 July 1994 and was my first web document on the Internet (Worthington 1994a). It was not intended to be a polished performance, but like a holiday slide show. The photographs were scanned at a resolution suitable for display on a personal computer and compressed to be transmitted in a reasonable time (about 30 seconds each) with a, then common, 9600 bps modem. 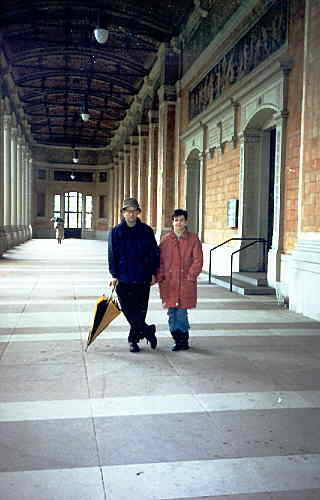 Jean-Pierre Favre, from the School of Environmental Design, University of Canberra, inspired the format. It is very difficult to arrange for visits when you are travelling. So, make your arrangements in advance. Summary: What should an information technology tourist see in Europe? Can you suggest any hi-tech related tourist activities for an Australian computer person in Europe in April? The details are still a little sketchy, but I will starting at Oxford UK, at the beginning of April, then travelling: London, Paris, Geneva, Avignon and Rome (leaving at the end of April). My colleagues at the Australian Computer Society have suggested a number of people in the national and regional IT societies and universities that I might visit during my holidays. Any suggestions on what hi-tech things to see? I get a bit bored on holiday looking at historic buildings and waterfalls. As an honorary director of the ACS community affairs board I look after a broad range of matters involving community issues with computers and communications. One recent interest has been public data networks and Australia's response to the USA's ``Data Highways'' proposals. My work for the Australian Government involves developing IT policy, particularly in the area of data administration, software engineering and open systems standards. ps: Can I drop in and check my e-mail at someone's place along the way? The first photo is the view out of the window of the Radford Infirmary - Oxford, the hospital where penicillin was first tested. 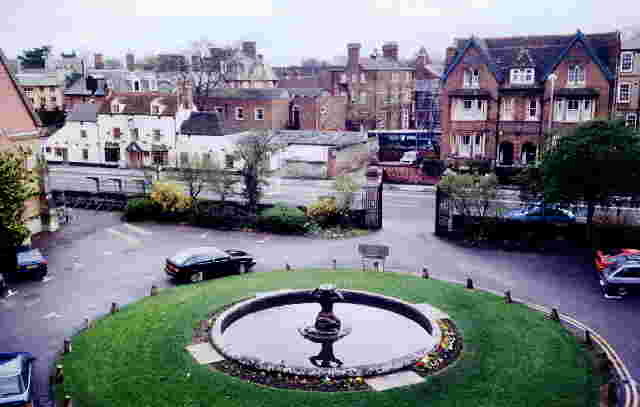 It also appears in the sets of some of the Inspector Morse, made for television, movies (Carlton Television 1999). To the right and over a bit is the Oxford University Computer Services centre. The infirmary has a stone floor in some parts. This has two curious features: it is worn from use and it is warm. Having arrived in Oxford and seen the hallowed halls I had to check the e-mail. Unfortunately it was just before Easter. Most University people were on holiday, so there was not anyone to visit. I had not warned anyone I was coming so I just called the computer centre. The help desk issued me with a temporary user-id, after I showed some identification. I sat next to the help desk for an hour and checked my mail. The system seemed a bit slow, but that may have been because my mailbox was on the other side of the world. It was just like being at home, in a computer centre, surrounded by computer people. A few kilometres outside Oxford is Blenheim Palace. The grounds have a lake designed by the English landscape architect Capability Brown. The lake is bisected by a bridge (visible in the distance in the photo), that carries a road from the Palace to a monument in the distance. The layout is reminiscent of that of Canberra's lake and Parliament House. Subject: Re: Stoppard play chaos theory character based on Ada? ``Just came back from the play `Arcadia' by Tom Stoppard, at the Sydney Opera House. It ties together, in an entertaining way: English landscape architecture, mathematics and poetry. The main character, Thomasina Coverty, is a young aristocrat and a mathematical genius, but is ignored because she is female. She is obsessed with mathematics involving iteration. Lord Byron also features in the play. I haven't seen the play, but the answer is almost certainly Yes. Ada was Lord Byron's only legitimate daughter. She was, however, kept away from her father and force-fed mathematics in the hopes that concentrating on something etherial would reduce the chances that she would be ``corrupted'' by having his blood in her veins. As it turned out, she was a mathematical genius, so it actually worked. Ada's full name was Augusta Ada Byron King, Countess of Lovelace. She took the ``king'' when she married Henry (?) King, Earl of Lovelace. Lady Lovelace was the world's first computer programmer. She was the only one who really understood Babbage's design for the Analytical Engine, and she wrote a series of notes on it. Her ``Note G'' is generally accepted to be the first computer program, a sequence of instructions to the machine to compute the Bernoulli Numbers. As the Analytical Engine was never built, her software never ran. In later life she developed an addiction to gambling, and tried to use mathematics as a means of developing a system to help her win. She died, rather horribly, of ovarian cancer in 1851. Hope this gives a little more useful background. The extension to Louvre Museum was like being in a French Telephone box: it is all made of glass. There is something passionate about the rational design of the public buildings and facilities of France. Around the corner from the Eiffel Tower I visited Fabienne Herbau at the Paris office of BHA Computers. This is a Brisbane based company, which I was involved in the development of a graphical user interface for at the Department of Defence (Worthington 1994b). The TGV high-speed train, like the glass telephone boxes, is a temple to rational modern design. Unfortunately I could not get the telephone on-board to work. Tom Worthington and myself are developing a paper on the above topic. Its purposes are for submission to sundry (Australian) committees, especially (admittedly belatedly) to the ASTEC RDN and Broadband groups, and for presentation at an international conference in Sydney in July. I append the abstract and other lead-in pages. The text is 20 pp. and there are 7 pp. of attachments. Anyone who is interested in a copy, please let me know. I can either email it (ASCII or RTF, or Eudora 1.4.1 using MIME), or work out which ftp/gopher site to put it up on. This paper's purpose is to establish the policy of the professional body of information technologists in Australia, the Australian Computer Society, in relation to the public interest in network services. Baden-Baden is a spa resort town with a wonderful Old BathHouse. Did not intend to stop in Strasbourg, but there was a rail strike. This was the only place in Europe where I had a hotel room where I could plug a modem into the telephone. Some hotels had no telephone, a telephone with no plug or an odd plug. Having a socket was not necessarily a good thing. I ran up a $AU200 telephone bill with one modem call. Please excuse any transmission errors in this message (my modem can't quite cope with the telephone lines here). I am sending this from a hotel room in Strasbourg, France, during an un-scheduled stop (the French long distance trains were on strike today). My PC stopped working a few days ago and I had to repair it with a pocket knife. We had rain in the UK, France, Switzerland, then floods and snow storms in Germany. In all it has been an interesting holiday. Next stop is the south of France (its raining there). Compare the design of the web version of this document with the 1994 original (Worthington 1994a). Which changes are due to development of web standards and which to increased experience of the web designer? What are the on-line policies of the countries of Europe? Is there a common European Union policy for the use of the Internet? What has this to do with the photograph of swans? What has happened to France's Minitel terminal system since 1994? What is the connection between the lake at Blenheim Palace and the play ``Arcadia'' by Tom Stoppard? What can you find out from open source (that is on-line) information about the places and people mentioned in this travelogue? Are any of the documents cited still on-line?